We know you LOVE to play golf and since we LOVE to have you playing at our course, we’ve created a deal every golf lover can’t resist: ALL YOU CAN PLAY for only $20 every day after 2 PM!!!! 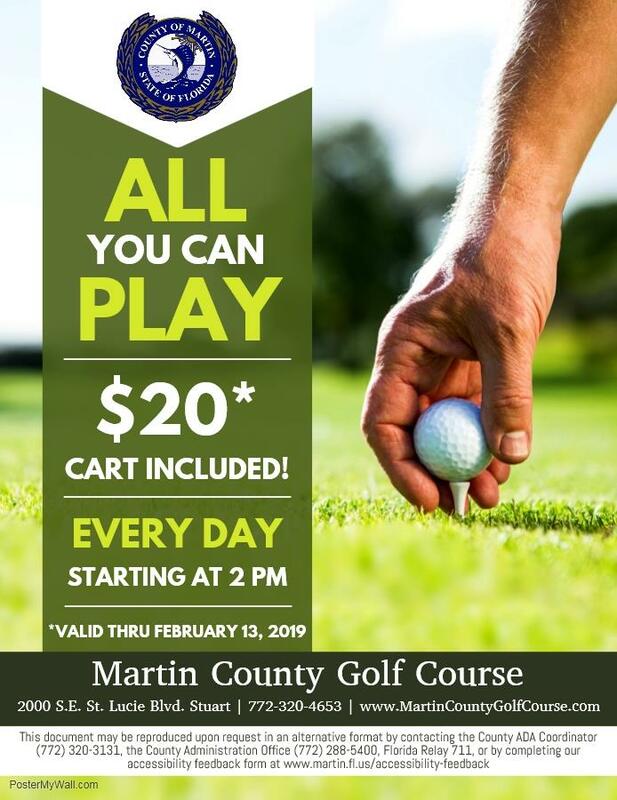 Hurry up and book your tee time now at https://www.martincountygolfcourse.com/tee-times, this offer is only valid thru February 13, 2019. Martin County Golf Course, part of the Florida Historic Golf Trail, offers two 18-hole courses, full-length driving range, putting and chipping greens, and over 100 brand new golf carts. Located in the heart of the Treasure Coast, in Stuart, Florida, the courses offer year-round, advanced tee time booking online. Play on History today!